all be winners, with no losers, at the game of life." The Way of the Small explores the principles of a sound, wholesome existence for both the individual and society. A practical and spiritual guide to fulfillment, it reframes the search for happiness, meaning, and success by giving us new perspectives derived from old wisdom. It illustrates that happiness is found in "the small"—in celebrating the precious small gifts of ordinary life and in experiencing the sacred in all aspects of life. Reminding us that "less is more, simpler is better," Michael Gellert offers a viable alternative to the grandiose thinking that is responsible for so many of our personal and global problems. Part One: WHAT IS THE WAY OF THE SMALL? "This is a jewel of a book. There is a pearl inside it. Read the words closely, and you will discover that pearl—elusive, precious, and tiny." "Balancing our inner and outer worlds, this beautiful book is both deeply spiritual and eminently practical. It masterfully empowers us to thrive in a simple way in our overwhelmingly complex times. Original, eloquent, wise, and inspiring, this is an important book that should be read by everyone." "A bold, persuasive book has come to teach us how we can all be winners, with no losers, at the game of life." "Gellert salutes the little actions of Mahatma Gandhi, Mother Teresa, Albert Schweitzer, Nelson Mandela, and others who are heroes of the small moral gesture that makes all the difference in the world.... The author makes a good case for the way of the small as an alternative to the path of grandiosity followed by so many individuals and nations. Simplicity and littleness are steps on the path to true joy and happiness." "This book is an invitation to set down our self-importance and embrace the glorious limits of our humanity. If you open it, you will be surprised and delighted and enriched." "Addressing the contemporary challenges of our fast-paced consumerist society and hunger for meaning, Jungian analyst Michael Gellert has put together a work that is inspiring and comprehensive. There are no easy answers here; this is not a book of pop psychology or easy religion. Rather, it is a thoughtful challenge to come back to ourselves, connect to what is real in the moment, and develop a way of living that is sustaining spiritually—regardless of your faith. The author's access to the texts and stories from all of the world's sacred traditions is truly impressive. However, it is this book's heart that is its central feature. Gellert allows us into his personal life; he tells us stories from his childhood; he tells us about his patients and how he talks with them about spirituality in a simple and direct manner. This is an invaluable book for these times in America. In many ways, The Way of the Small could be seen as an answer to Gellert's earlier work, The Fate of America. This book touched me deeply. I'm sure that I will return to it often." "This fascinating book is enormously enjoyable while being very learned, convincing, and unconventional. It teaches us that there are limits to our modern idea that 'bigger is better,' and that true progress, in a religious and moral sense, demands us to become smaller and more modest." 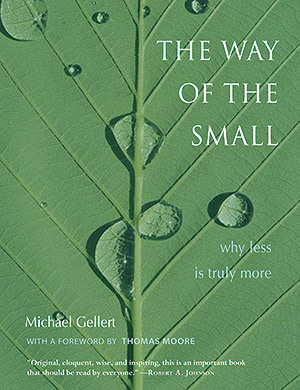 "What a treat to read The Way of The Small by Michael Gellert. It is inspirational, and filled with wise stories that are immediately useful in daily life. It is superbly written, a real page turner and runs the gamit from tears to laughter in its pages. A book to own and to give as gifts to friends, colleagues and neighbors. It is so readable and enjoyable you will congratulate yourself for having discovered it, as I have." "Psychoanalyst Gellert (The Fate of America) gives readers a chance to feel big in small ways with this guide to cultivating a 'less is more, simpler is better' life. Both a Zen-like meditation on the significance of insignificance and a cultural-historical tour of an idea—an 'organic way of living' rather than a 'theory, formula, or fixed belief system'—Gellert locates and celebrates the small in individual experience (including his own and those of his patients), all the major world religions and the Big Bang, among other settings. Eloquent consideration of ideas like 'celebrating the right details' and 'embracing diminishment' follows, as well as more practical strategy like 'facing adversity with humor,' 'letting go of perfection' and the 'mystical idea of amor fati, or loving your fate.' Covering a decidedly large range of issues—love, death, warfare, morality, humankind and the cosmos—Gellert applies his 'small' principle confidently but perhaps too broadly; still, Gellert's graceful text will definitely boost readers' capacity for accepting one's predicament and finding satisfaction in the slight." "Brilliant, unique, and inspirational, The Way of the Small helped me to understand what it is to be truly human." "The Way of the Small is a whale of a book. . . . Reading this book with attention will give one a beautiful if sparing education in spiritual insight, and more importantly will subliminally allow an experience of one's own shadow and the blockages and thought processes that keep one from wholeness and total immersion in life. Michael Gellert's gift here is that in making us aware of the contradictions and smallness of which he speaks, he brings us to a realization of who we are in this moment. The mystery is the healing that is present in this wholeness. To do this is no small task, yet it is met humbly with personal verve and the acumen of a lifelong student of the human soul (as well the depth of a scholarly Jungian analyst).... Michael Gellert's small book deserves a wide audience and is of great use to those who are inclined to ask those inevitable questions that come after insight: What can I do about it? What should I do? What is my responsibility? The answer seems to lie in the details. It's all in the small stuff. And in that small stuff is all the energy that gets lost in our big containers." "If you have ever bought a book to try to figure out how to be happy or looked for ways to be more tranquil, then your collection could be more complete with this book which begs to be a classic. . . . It is a book you will read and reread at different stages of your life and get something new each time you read it. I work for a Fortune 500 company and we are in the process of contacting this author to arrange for seminars for our employees."